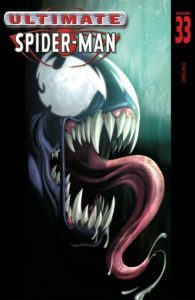 The Marvel Ultimate Universe comic boks definitive issue-by-issue collecting guide and trade reading order for omnibus, hardcover, and trade paperback collections. Find every issue and appearance from Marvel Ultimate! Part of Crushing Krisis’s Crushing Comics. Last updated December 2017 with titles solicited for release through August 2018. The simplest way to think about it is as a new-millennium, ground-up reboot of the four most enduring Marvel Silver Age properties – Spider-Man, X-Men, The Avengers (as Ultimates), and Fantastic Four. That frequently made for a take on Marvel’s heroes that was both more edgy and more grounded. There were fewer aliens, magic, and resurrections, and more real-world socio-political ramifications. While the line wasn’t for Mature Readers, the combination of those factors could sometimes lead to a grimmer take than the main Marvel universe. The Ultimate Universe was thoroughly covered in collected editions as it was released, which means you definitely can own every issue of every title with no gaps and hardly any overlap. As a result, this guide does not include an exhaustive list of where singles issues may be collected out of context. Below I’ve broken the Ultimate Universe into four eras punctuated by four major events that reset the line. Within each era books are listed in order of their launch, but for a more threaded view I’ve also listed them by threaded reading order. Previously issued as a B&N exclusive version. Further paperback Ultimate Collections are not yet solicited. Ultimate X-Men begins during this arc. During #21: Spider-Man appears in Ultimate Marvel Team-Up (2001) #14-16. 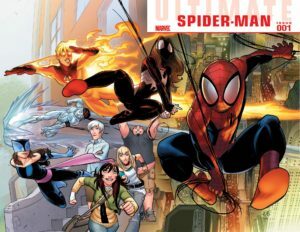 Ultimate Spider-Man Special was released around the time of #22, but is not considered to be in continuity. Yes, Volume 9, not Volume 8. Ultimate Six (2003) #1-7 (Spider-Man appears in #3-7) directly follows Volume 7. To make this even more puzzling, #46 is a story told mostly in flashback. Annual 3: Fits after #120, but is collected below. Annual three occurs after #120, above. Spider-Man does not appear in #133. Available in hardcover. Also, see Ultimatum, below. Collects Ultimate Fantastic Four/Ultimate X-Men Annual #1, Ultimate X-Men/Ultimate Fantastic Four Annual #1, Ultimate Captain America Annual #1, Ultimate Hulk Annual #1, and Ultimate Spider-Man Annual #3. Available in hardcover. This series continues to Ultimate Spider-Man, Vol. 2 (2009), below. Legacy numbering of this volume would later continue through #160 as well as a standalone #200. As with the original Marvel Team-Up, this is a Spider-Man team-up title, occurring between issues #7-21 of his main title. Issue #9, starring the FF, was later deemed to be out of continuity. Hulk debuts in #2-3. Iron Man debuts in #4-5 with Nick Fury in #5. Black Widow debuts in #14. Daredevil debuts in #7-8, although he later appears in prequel stories in Ultimate Daredevil & Elektra (2003) and Ultimate Elektra (2004). His full chronology is listed under Ultimate Daredevil & Elektra. Also includes Ultimate Spider-Man (2000) Special 1. Available as a trade paperback Ultimate Collection. 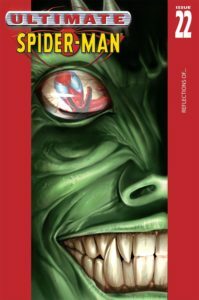 The Best of Spider-Man Vol. 01, Daredevil Ultimate Collection Vol. 03, and Daredevil by Brian Michael Bendis & Alex Maleev Omnibus Vol. 02, as well as the Ultimate collections, above. So far this order addresses the appearances of Wolverine, Jean, and Cyclops. It does not yet include Jean as Phoenix, Storm, Iceman, Beast, Colossus, and Kitty Pryde. #1/2: Follows six. Collected in Deluxe Hardcover and Ultimate Collection, above. Also, see Ultimate War, below. 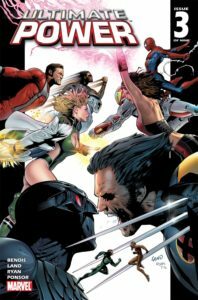 Collects Ultimate War #1-4This is the first major X-Men and Ultimates crossover. Despite #25 stating at the end of the issue that it proceeds to this mini-series, you can optionally read #26 prior to Ultimate War as well – it’s mostly a flashback issue with a single present-day panel that is concurrent with Ultimate War #1. The event runs alongside #26-27 and resolves prior to #28. During #26-27: X-Men appear in Ultimate War. Ultimate Nightmare: See below. This occurs between #60 and Annual 1. Ultimate Extinction: See below. This occurs between #60 and Annual 1. Ultimate Wolverine Vs. Hulk: Also, see below. This occurs during #70-71 for Wolverine. Ultimate Power: See below. This is a line-wide crossover event that happens all at once rather than being interspersed with issues of the ongoing series. Wolverine and Cyclops appear in Ultimate Power (2006) #2-9. Jean appears in Ultimate Power (2006) #2-4. Also collects Ultimate Fantastic Four #58-60. Available in hardcover. This series does not directly continue after Ultimatum and Ultimatum: X-Men Requiem. The next X title is Ultimate X, below. Iron Man debuts in Ultimate Marvel Team-Up (2001) #4-5 before appearing in The Ultimates. Thor debuts in #4, but has a preceding story in Ultimate Thor (2010). Hawkeye debuts in #7. Collects Ultimates #1-13, Ultimates 2 #1-13, and Ultimates Annual #1. Note that it does not include Annual 2. Hulk does not appear in #1. The Ultimates continue to Ultimate War (except Pym, who skips War to continue to Ultimate Six). Quicksilver and Scarlet Witch continue from #13 to Ultimate X-Men #22, above. This series stars Hawk-Owl, who does not appear again, so it’s relatively standalone aside from the appearance of The Ultimates in #3-4. This is a prequel to Daredevil’s debut in Ultimate Marvel Team-Up, above, which makes these the earliest issues (rather than single flashback scenes inside of a modern framing device) of Ultimate continuity along with Ultimate Thor. Also includes Daredevil (1998) #9 from main Marvel continuity. #1 is also collected in Daredevil: The Movie. Both characters continue to Ultimate Elektra, below. This is an X-Men & Ultimates crossover event that was primarily recollected along with X-Men. It continues from Ultimate X-Men #25-26 and the end of Ultimates, both above. 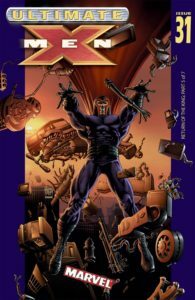 Collected in paperback as Ultimate X-Men, Vol. 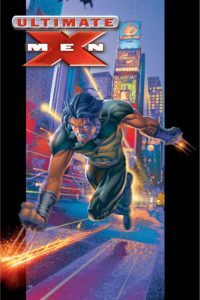 5: Ultimate War and Ultimate X-Men Ultimate Collection, Book 3. Collected in oversize hardcover in Ultimate X-Men Deluxe Hardcover Vol. 3. Iron Man and Thor continue to Ultimate X-Men (2001) #32, then Ultimate Six. 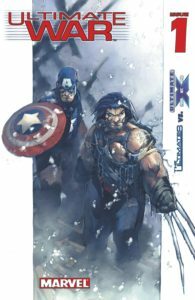 Captain America is next implied in Ultimate X-Men (2001) #33, then appears in Ultimate Six. Hawkeye continues directly to Ultimate Six. Hulk is implied in a Ultimate Six #4-5, but he’s next on-panel in Ultimates 2. A Spider-Man and The Ultimates crossover that continues from Ultimate Spider-Man #46 and Ultimate War, respectively. Note that Hulk does not appear. Captain America continues to Ultimate Spider-Man (2000) #70 (flashback), Ultimate Fantastic Four (2004) #21 & 32, and then to Ultimate Nightmare. Iron Man continues to Ultimate Spider-Man (2000) #70 & 77, Ultimate Fantastic Four (2004) #21 & 32, and then to Ultimate Secret. Thor continues to Ultimate Fantastic Four (2004) #27 & 32, and then to Ultimate Secret. 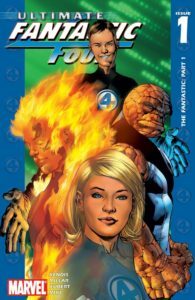 Initially launched by Brian Bendis, Fantastic Four wouldn’t find the single-writer stability of the other Ultimate flagships until Mike Carey took over in the mid-30s. Also collects Ultimate X-Men/Ultimate Fantastic Four and Ultimate Fantastic Four/Ultimate X-Men. This curiously short book is padded with Official Handbook of the Ultimate Marvel Universe #1-2, and Ultimate Secrets (2008) handbook, since all subsequent stories with this team tie-in to Ultimatum. Ultimate Secret: See below. The team appears in #2-4. Between Secret & Extinction: Reed appears in the 2nd stories of Ultimate Spider-Man (2000) #86 & 88. Sue also appears in 88. Ultimate Extinction: See below. Thing and Torch do not appear. 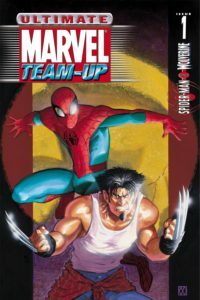 After Annuals, Team appears in Ultimate Origins (2008) #2-5 – though, much of that is in flashback, and Torch in Ultimate Spider-Man (2000) #129. Ultimatum begins parallel to #58. 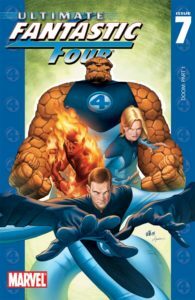 This title continues to Ultimatum: Fantastic Four Requiem, and the next appears in Ultimate Enemy Trilogy, which is effectively the next Fantastic Four volume. This is another flashback series that continues from Ultimate Daredevil & Elektra and which is set prior to Daredevil’s debut in Ultimate Marvel Team-Up. Together, this trilogy serves as a three-act a line-wide event gathering all of the Ultimate Universe together save for Spider-Man. The entire trilogy is collected in a single paperback and deluxe hardcover. Collects Ultimate Nightmare (2004) #1-5, Ultimate Secret (2005) #1-4, Ultimate Extinction (2006) #1-5, and Ultimate Vision #0. Also collected in oversize hardcover. Alternately, the trilogy was collected in individual TPBs as it was released. 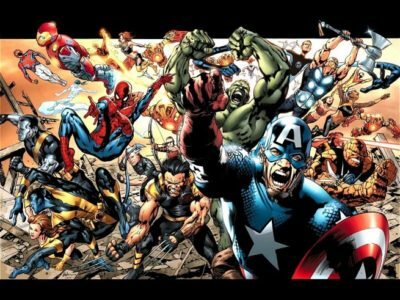 Includes several X-Men (after #60) and the Ultimates represented by Captain America (after Ultimate Six), Black Widow, & Nick Fury. 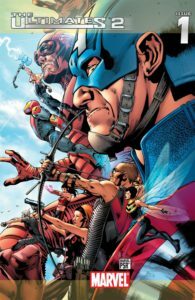 The majority of this cast (including Captain America) drop by Ultimate Spider-Man (2000) #88 (2nd story) before skipping Secret to continue to Extinction. Primarily focused on Fantastic Four (after #32, which was released later than this begins), plus Iron Man, Hawkeye, and Thor (all after Ultimate Six). Iron Man and Thor appear from #2, Hawkeye in #3-4. Hawkeye and Thor continues to Ultimate Spider-Man (2000) #126 (a later arc that occurs during this prior period) and then to Ultimates 2. This combines most of the cast of the prior two installments plus some X-Men and occurs prior to Ultimates 2 even though it began a month later. 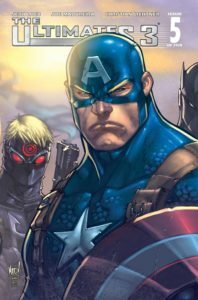 Captain America continues here (#2-5) from Ultimate Nightmare. Iron Man continues here (#3-5) from Ultimate Secret. Fantastic Four continue to Ultimate X-Men/Fantastic Four & Ultimate Fantastic Four/X-Men, then to Annual 2 of their own series. This Orson Scott Card series was retconned as a fictionalized version of the Ultimate Comics Universe Iron Man, which means this story is not in continuity. Captain America and Iron Man continue from Extinction via Ultimate Spider-Man #126. Hawkeye continues from Secret. Hulk continues from Ultimate War and appears in only #1-3 & 11-13. After Annual 1, Captain America and Iron Man appear in Ultimate X-Men #63-64. Iron Man then appears in Ultimate Spider-Man (2000) #90. Hulk continues to Ultimate Wolverine Vs. Hulk (2006) and then to Ultimate Power. Thor continues to Ultimate Captain America (2011) #Annual 1 (implied in the 2nd story) and then to Ultimate Power. This mini-series is written by JJ Abrams acolyte Damon Lindelof, of Lost infamy. Wolverine continues from Ultimate X-Men #69; Hulk continues from Ultimates 2 #13. Wolverine returns to Ultimate X-Men #72. Hulk continues to Ultimate Power. A line-wide crossover event between the Supreme Power universe and Ultimate Marvel. Spider-Man appears from his #111. X-Men appear from their #88. Generally, Ultimates (including Cap, Hawkeye, Iron Man, and Thor) appear directly from Ultimates 2 (and begin in #2) except Hulk, who appears from Ultimate Wolverine vs. Hulk (and appears in #7-9); Fantastic Four appear from #46. Hulk continues to Ultimate Fantastic Four (2004) #52-53, then to Ultimate Human. Iron Man continues to Ultimate Spider-Man (2000) #127 (flashback), Ultimate Spider-Man (2000) #113, and Ultimate Fantastic Four (2004) #52-53 before Ultimate Human. Continues Vision’s story from the end of the Ultimate Galactus Trilogy. #0: Collected with Ultimate Galactus, above. There is no direct continuance of this series, but it ends prior to Ultimates 2. Effectively Ultimate Hulk vs. Iron Man. Both Hulk and Iron Man continue to here from Ultimate Power. Iron Man is in flashbacks in Ultimatum: Spider-Man Requiem (2009) #1 and Ultimate Spider-Man (2000) #128 before continuing to Ultimates 3. This is technically part of the March To Ultimatum. Captain America, Hawkeye, and Thor continue here from Ultimate Power. Iron Man continues from Ultimate Human. #1-5: Who Killed The Scarlet Witch? Iron Man continues to Ultimate Origins (2008) #3 and is implied inUltimate Spider-Man (2000) #129 before continuing to Ultimatum. Hulk appears here from Ultimate Human and continues to Ultimatum, during which he also appears in Ultimate Spider-Man #130-133. See March on Ultimatum, just below. This massive event caused the cancellation of all of the ongoing Ultimate titles and saw many characters killed or fundamentally altered. It’s also loathed almost by a clear majority of fans like no other Marvel story of which I am aware. Collects Ultimate Captain America (2008) Annual 1, Ultimate Fantastic Four/Ultimate X-Men Annual (2008) #1, Ultimate Hulk (2008) Annual 1, Ultimate Spider-Man (2000) Annual 03, Ultimate X-Men/Ultimate Fantastic Four Annual (2008) #1. Available in hardcover. A series that sets up Ultimatum while flashing back to the formative years of Ultimate Marvel. Many Ultimate characters from all four of the anchor titles appear. Available in hardcover. Collects Ultimatum: Spider-Man Requiem #1-2, Fantastic Four Requiem #1, and X-Men Requiem #1. Available in hardcover. Captain America continues from Spider-Man Requiem #2 and X-Men Requiem to Ultimate Avengers. Hawkeye continues to Ultimate Avengers. Hulk appears in Ultimate X (2010) #5 and Ultimate Fallout (2011) #3 before continuing to Ultimate Comics Hawkeye. Reed continues to a flashback in Ultimate Comics Ultimates (2011) #30, Ultimate Avengers (2009) #2, and Ultimate Enemy (2010) #1 before SPOILER (highlight to read): continuing as “Maker” in Ultimate Mystery. Torch continues to become a supporting cast member in Ultimate Spider-Man. 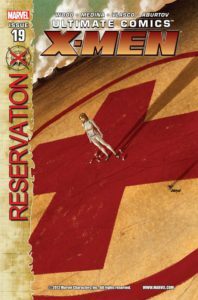 The X-Men are effectively disbanded in their Requiem one-shot. Jean Grey next appears in Ultimate X. Kitty Pryde joins the cast of Ultimate Spider-Man, below. Effectively, each 6-issue sprint is one volume – 1 (2009-2010), 2 (2010), and 3 (2010-2011). Captain America and Hawkeye appear throughout, adding Black Widow II, Nerd Hulk, and War Machine. Available in hardcover. Stars Hawkeye (from #2), Black Widow II, Nick Fury, Punisher, Tyrone Cash, Ghost Rider, and War Machine. Captain America appears only in #1. Available in hardcover. During #1, Captain America departs to Ultimate New Ultimates (2010) #1-5, Ultimate Spider-Man (2000) #150, Ultimate Doom (2011) #4, and then continues to his own series before returning to Ultimate Avengers 3. Hawkeye continues to Ultimate New Ultimates (2010) #1-5. Captain America, Hawkeye, Black Widow, Nerd Hulk, Blade, Daredevil II, and Stick appear throughout. Available in hardcover. The entire cast of Ultimate Avengers 3 continue to Ultimate Avengers Vs. New Ultimates. Spider-Man continues directly from Spider-Man Requiem #2. 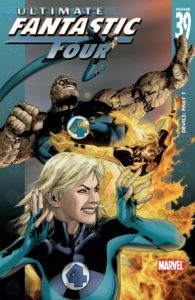 Human Torch and Kitty Pryde join this series from the events of Ultimatum and star throughout except where noted. Collects Ultimate Comics Spider-man (2009) #15 and #150-160, Ultimate Comics Avengers Vs. New Ultimates #1-6, and Ultimate Comics Fallout #1-6. After #10, Kitty Pryde appears in Ultimate X #1 and then returns for #155 only. Title is renumbered to original, legacy numbering with #150. After #15, Torch appears in Ultimate Avengers (2009) #2 and a retroactive story in Ultimate Comics Spider-Man (2011) #2. After #152, Torch continues to Ultimate Enemy #2 and continues through the end of the Ultimate Enemy Trilogy, at which point he returns to this title with #155 and then skips #156-157. Human Torch and Kitty Pryde continue to Ultimate Fallout, which is effectively the continuation of this title. Spider-Man is implied or mentioned in Ultimate Fallout (2011) #1-3 and Ultimate Avengers Vs. New Ultimates (2011) #6 but does not appear in an in-continuity fashion. 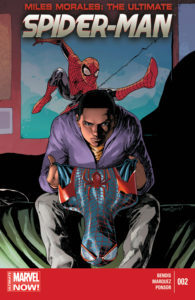 He appears in flashback in Miles Morales: Ultimate Spider-Man (2014) #6 (9) (flashback) and is referenced in Ultimate Comics Spider-Man (2011) #200. He is also a significant factor in Miles Morales: Ultimate Spider-Man (2014) #1-7, but I can’t say more due to spoilers. Sue and Thing continue here from Ultimatum. Torch (from #2) appears from Ultimate Spider-Man #152. Maker debuts here in #3 (he is implied in #2). Collects Ultimate Comics Enemy #1-4, Ultimate Comics Mystery #1-4, Ultimate Comics Doom #1-4. Also available in oversize hardcover. Maker appears in Ultimate Fallout (2011) #4 before continuing to Ultimate Comics Ultimates. 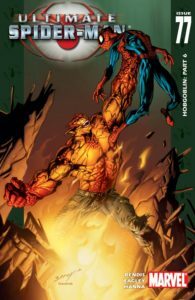 Torch returns to Ultimate Spider-Man (2000) #155 & 158-160 before continuing to Ultimate Fallout. Kitty Pryde appears in one from Ultimate Spider-Man #10 and returns to #155. Jean Grey continues here from Ultimatum. 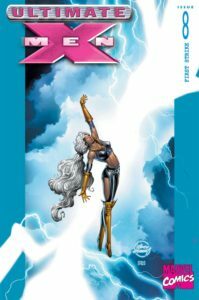 Storm, Rogue, Firestar, and Quicksilver make their first post-Ultimatum appearances. A new Wolverine is introduced. 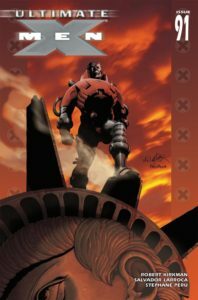 A handful of characters continue to various issues of Ultimate Fallout, but the majority of them are next found in Ultimate Comics X-Men. Hawkeye next appears in Ultimate Enemy (2010) #4, Ultimate Doom (2011) #4, Ultimate Captain America (2011) #1 (flashback), Ultimate Captain America (2011) #4 before continuing to Ultimate Avengers 3, above. Thor next appears in Ultimate Spider-Man (2000) #150 and Ultimate Doom (2011) #4 before continuing to Ultimate Avengers Vs. New Ultimates. This is a prequel story that precedes Thor’s appearance in the original Ultimates series. Captain America continues from Ultimate Comics Avengers 2 #1. 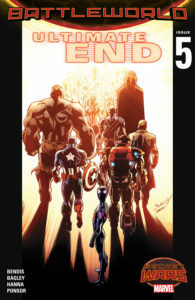 Captain America continues to Ultimate Comics Avengers 3 #1, above. Published as part of the “Death of Spider-Man” event banner. 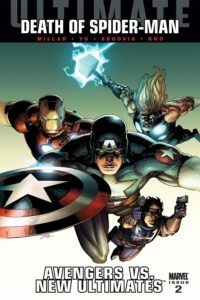 All characters effectively continue from Ultimate Avengers 3 #6, with the exception of Thor who continues from Ultimate Doom. Hawkeye (begins in #2) continues from Ultimate Avengers 3. Generally, you can think of this as continuing to Ultimate Fallout and then to Ultimate Comics Ultimates. After #2, Captain America appears in Ultimate Spider-Man (2000) #156. 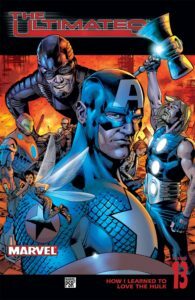 During #6, Captain America appears in Ultimate Fallout #1-3 before continuing to Ultimate Comics Ultimates with #5. Hawkeye next appears in Ultimate Fallout (2011) #5 before continuing to Ultimate Comics Hawkeye. 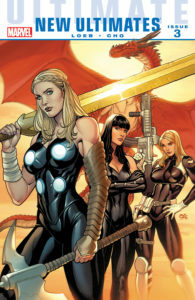 During #6, Thor appears in Ultimate Fallout before continuing to Ultimate Comics Ultimates. Collecting Ultimate Comics Spider-Man (2009) #15 and #150-160, Ultimate Comics Avengers vs. New Ultimates #1-6, and Ultimate Comics Fallout #1-6. 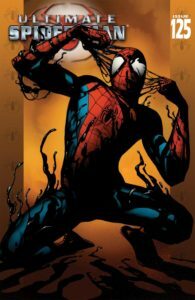 The Mile Morales story from issue #4 is collected with Ultimate Comics Spider-Man, below. 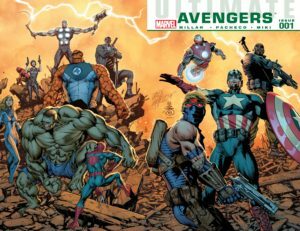 Captain America and Thor return to the end of Ultimate Avengers vs. New Ultimates and then continue to Ultimate Comics Ultimates in #5 and #1, respectively. Torch continues as a supporting character in Ultimate Comics X-Men (2011). 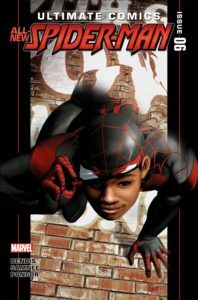 Introduces Miles Morales as Spider-Man. Technically, his debut was in Ultimate Fallout #4, but the initial issues of his own series precede that story in continuity. During #4, Miles is implied in Ultimate Spider-Man (2000) #160 and Ultimate Fallout (2011) #1, and then appears in Ultimate Fallout (2011) #4. Available in hardcover. Recollected in Miles Morales: Spider-Man (2019 paperback), likely along with the contents of Vol. 1. 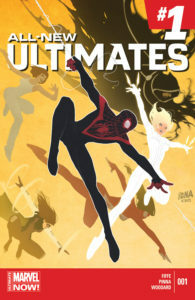 Simultaneous to the final page of #16, Miles appears in Ultimate Comics Ultimates #16-17. After #28, Miles cameos in Age Of Ultron (2013) #10. Hawkeye continues here from Ultimate Avengers vs. New Ultimates by way of Ultimate Fallout #5. Hulk continues here from Ultimatum and appears in #2-4. Hawkeye continues to Ultimate Comics Ultimates, where he appears in #1 during this series. Hulk also continues there beginning in #7. Unifies the split casts of Ultimates and Avengers, though the characters aren’t necessarily united. Collects Ultimate Comics X-Men #13-18, Ultimate Comics Ultimates #13-18, and Ultimate Comics Spider-Man #13-18. Available in oversize hardcover. Black Widow II appears in #3-11, 14-8 and Ultimate Comics Spider-Man (2011) #16, #17-18, 18.1, and 19-30. She next appears in Ultimate Comics Spider-Man #28 and then in Cataclysm: Ultimate Comics Spider-Man #1. Kitty Pryde and Human Torch continue here from Ultimate Fallout. Jean Grey and Wolverine II continue from Ultimate X. Human Torch continues as a supporting character in Ultimate Comics X-Men (2011) #1-6, 11, 13-14, and 18. Jean Grey departs after #1 to appear in Ultimate Comics Hawkeye #2-4 before returning in #8 and then most issues from #17 forward. Kitty Pryde and Wolverine (along with Rogue, Storm, and other characters) appear in Ultimate Comics Wolverine #1-4 from #22 and return in #24. Continues to Cataclysm: X-Men #1. Continues here from Ultimate Comics Ultimates #18 and returns there for #18.1. Carol Danvers appears throughout. 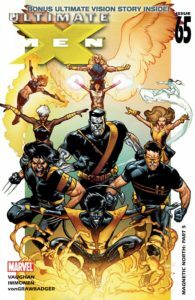 Effectively could be considered to be Ultimate Comics X-Men #22.1-3, as much of the cast appears here during #23, which does not feature them. Note that individual character tracking ends here, with the exception of Miles Morales! That’s because this event is summed up in a single book, and the three new series that follow have relatively contained casts. 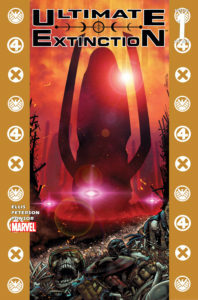 The Ultimate Universe is thrown into upheaval when the 616-Universe Galactus invades their reality thanks to the hole in reality created by Age of Ultron. All titles grind to a halt for a series of Cataclysm mini-series, which placed the survival of the entire line in question. All series are included in a single collection of this event. From the ashes of Cataclysm a slimmed down new line of three Ultimate Comics briefly emerged. This is not the past decade’s Ultimates! 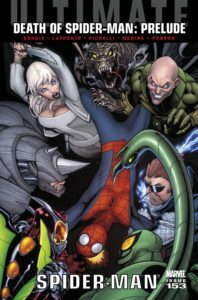 Lead by Kitty Pryde, the book featured a number of secondary characters like Black Widow III (Jessica Drew, our Spider-Woman), Bombshell II, Cloak & Dagger, Diamondback, King Cobra, and Mile Morales as Spider-Man. Miles continues from Cataclysm. Before this series begins (but after Ultimate Spider-Man #200), Miles makes a pair of rare 616-continuity appearances. He also appears in All-New Ultimates during this period. 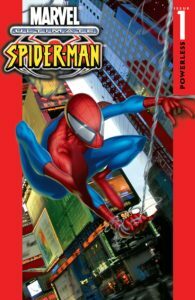 Includes Ultimate Spider-Man #200, which is Miles’s first chronological appearance after Cataclysm. Miles continues to Secret Wars. This series, penned by Joshua Hale Fialkov, featured many of the characters and plots from Ultimates, but failed to catch on with readers. The Ultimate Universe begins to appear in 616-Universe Avengers and New Avengers during Time Runs Out, culminating in the two Universes colliding in Secret Wars #0-1. From there, Secret Wars is effectively the only Marvel story, though it featured many tie-ins with characters of dubious lineage. 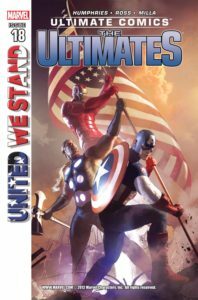 However, the Ultimate Comics story is (somewhat) resolved in Ultimate End (2015), which reunited Ultimate Comics originators Brian Bendis and Mark Bagley for a final five issues. Miles Morales and some of his non-super-powered supporting cast continue to Spider-Man (2015). Maker continues to New Avengers (2015). Ultimate Thor’s hammer is a major plot point in The Unworthy Thor (2016). Check Amazon for Marvel’s newest Ultimate Marvel titles. Hi, I know this may be a lightly outdated topic, but I have a bunch of hardcovers I’ve collected and am now trying to complete the whole collection. 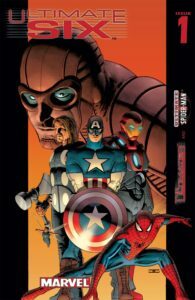 I was wondering if it’s possible to get a list of all the Hardcover books to cover the whole of the Ultimate universe issues? Is this possible, I know above they are included in the threaded reading orders, but would it be possible to get a complete list, along with what would be missing from them to also collect alongside?